Anne's Food: Happy Blog Birthday! Today is my blog's second birthday! Awww, my little baby has grown so big! I can hardly believe it! I don't keep a close eye on statistics, but I can see that I have a LOT of visitors. That makes me very happy - thank you all so very much for visiting me!! Oh - wanna see my very first post? Right here! Now, a year ago I baked a Princess Cake. 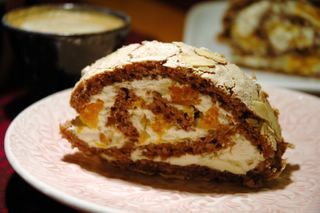 Today, I thought I'd make good on my New Year's Resolution, and finally bake a Budapest roll. As with so many kitchen fears, this one turned out to be unfounded. It wasn't very hard at all! And this is a *very* popular cake here, most people I know actually say that it's their very favorite. You can buy it by the piece in most cafés. Where it got its name from? Sorry, I have no idea. Start by preheating the oven to 150°C. Blitz the hazelnuts in a food processor until finely chopped. Mix with cocoa powder and flour in a bowl. Beat the eggwhites until they start to firm up. Gradually add the sugar, and beat until you have a thick, glossy meringue. 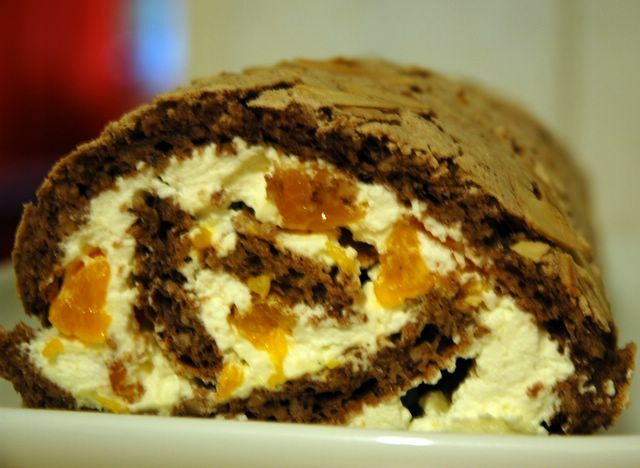 Fold in the nut mixture, and spread on baking paper in a jelly roll pan. Sprinkle over the flaked almonds. Bake for about 20 minutes - but after 15 minutes, turn the heat up to 175°C. Drain the mandarin oranges, beat the whipping cream until stiff, and mix together. Spread this onto the cake. Now, it's time to roll! Roll as you would a sushi roll, using the sheet the cake is on to help making it tight. Be very gentle, or the cake will crack. Roll all the way to the end. Slice off the ends - baker's treat - and move the cake to a plate. Let it set in the fridge for a couple of hours - it can be frozen, too. Before serving, you can drizzle with melted chocolate or dust with powdered sugar, or what I did - nothing. Happy birthday, Anne' Food blog! I love reading your blog. Happy blog birthday! The cake looks delicious. I think I'd probably eat a few bites and then disassemble it, devouring the creamy filling and then eating the surrounding cake with a cup of coffee :). Happy blog birthday, Anne! Your Budapest roll looks delicious, and it's not a cake we know here, so I might give it a try soon. Thanks for the recipe! Happy B'B'day! Seriously Good turns three on the 31st of this month. Happy blog birthday indeed :)! Oh wait. I was supposed to be saying Happy Blog Birthday. Grattis! JAg ska fira dig med att göra den där pytten med sötpotatis imorgon. den verkar så god! Congratulations! I've only been food blogging a month but it's something I wish I'd been doing for two years... I can't believe it's taken me this long to start one! I only found your site today but I look forward to trying out your recipes - your food looks delicious. Happy Birthday! Hi Anne! I'm so happy to find this. When I was a child inPasadena, California, one of my favorite restaurants was a place called Konditori, which specialized in Danish style open- faced sandwiches (smorrebrod, I think) and anincredible array of fancy pastries, from rum balls on up through Princess Cake. My favorite was the Budapest. Konditori is long gone, but my search for a Budapest recipe led me here! I will have to let you know how mine comes out. Thanks! I've been looking for this recipe for a while,. Thanks!